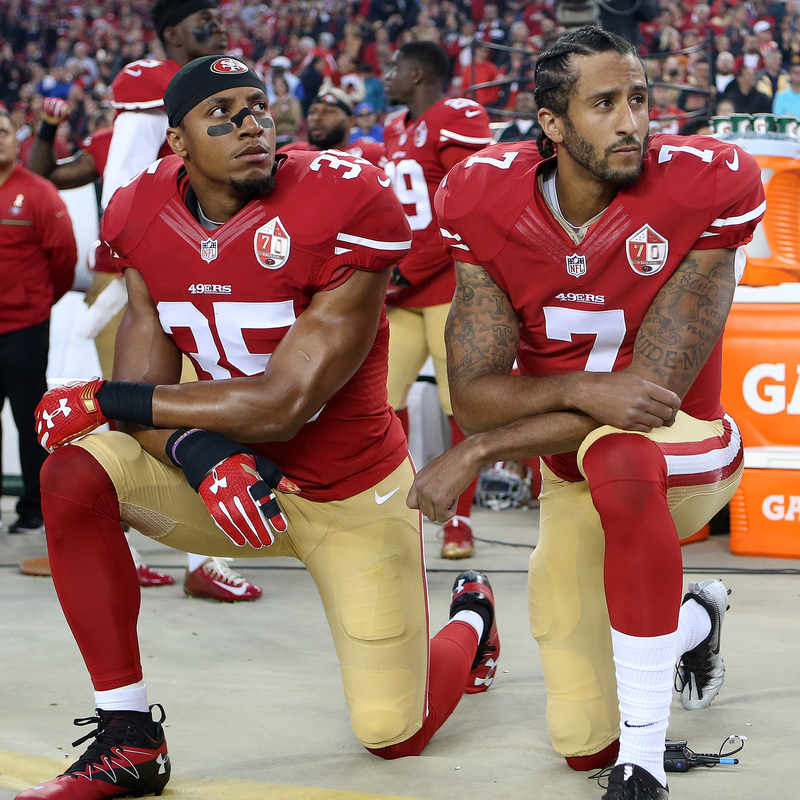 Kaepernick Files Grievance Saying NFL, Owners Conspired To Shut Him Out : The Two-Way The former San Francisco 49ers quarterback says the league and team owners colluded to shut him out of a contract over his pregame protests during the national anthem. Free-agent NFL quarterback Colin Kaepernick has filed a grievance against the NFL and team owners alleging that they colluded to keep him out of the league following his pregame protests during the National Anthem. Kaepernick, the former San Francisco 49ers quarterback who took a knee during the playing of the national anthem before games last season to protest police treatment of blacks, alleges that the NFL and team owners violated anti-collusion provisions in the league's collective bargaining agreement with its players. "If the NFL (as well as all professional sports teams) is to remain a meritocracy, then principled and peaceful protest — which the owners themselves made great theater imitating weeks ago — should not be punished and athletes should not be denied employment based on partisan political provocation by the Executive Branch of our government," Kaepernick's attorney, Mark Geragos said in a statement, according to ESPN. "Such a precedent threatens all patriotic Americans and harkens back to our darkest days as a nation. Protecting all athletes from such collusive conduct is what compelled Mr. Kaepernick to file his grievance," Geragos said. Why Kaepernick Is Unsigned: Performance Or Politics? "Kaepernick is not going through the NFL Players Association but has instead hired Geragos, who has represented several high-profile clients, including Michael Jackson, former NASCAR driver Jeremy Mayfield and musician Chris Brown." As NPR's Tom Goldman reported back in August, when it became clear that Kaepernick would go unsigned by any team, collusion is difficult to prove. The language of the provision in the collective-bargaining agreement that Kaepernick cites requires "clear and convincing evidence of a violation." Even so, Tom explains in a newscast report, "to prove collusion, [Kaepernick] doesn't have to show every team is conspiring – it can be as few as two teams, or one team and the league agree they want to keep out the former Super Bowl quarterback."